I made these little bites for a quick snack for a client. They are simple to make, all in one bowl. 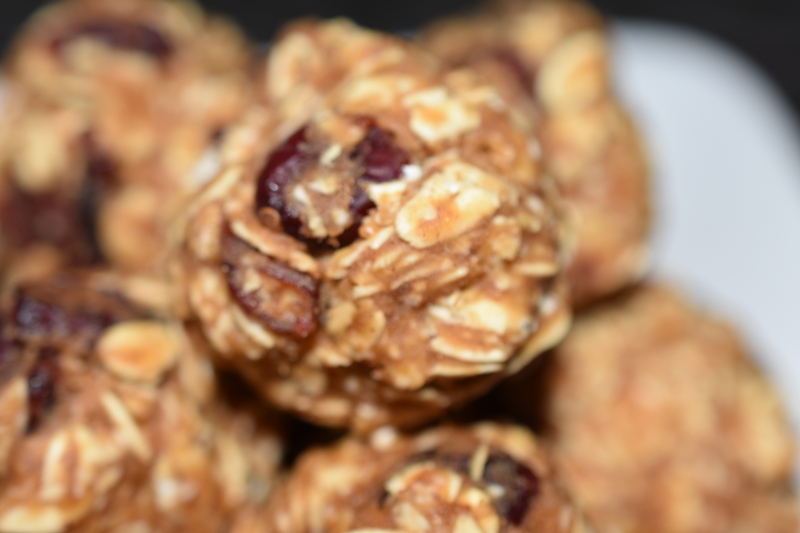 This recipe makes 23 individual bites. Be careful they are slightly addictive. Combine all the ingredients into a large bowl. Thoroughly mix the ingredients until they are well combined. Form the mixture into little balls. Freeze the little balls for about 10 minutes to set and firm up. Then you can store them in a sealable container in the refrigerator. 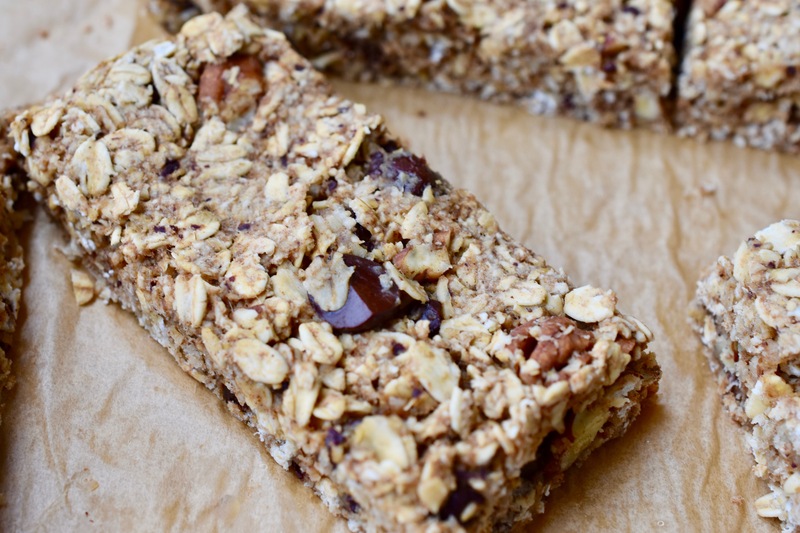 These bars are perfect for a grab-n-go breakfast, but also for a snack anytime of the day. So go ahead and put one in the lunch box, or carry one in your purse for when you get the hungries. By the way, this is a one bowl recipe. Preheat oven to 350 degrees. Line an 8×8-inch baking dish with parchment paper. Combine all the ingredients into a large bowl and stir until well combined. Press oat mixture into the prepared baking dish. Press the dough with a spatula into an even layer. Using a sharp knife score the dough into 8 pieces. bake until the bars are golden on the edges, about 20 minutes. Remove from oven and let cool in dish. Following the scored lines, use a sharp knife to cut the bars. Store in a sealable container in the refrigerator. Note: You can make the oat flour be processing it into a food processor or spice/coffee grinder. I made these little bites for a quick snack for a client. They are simple to make, all in one bowl. 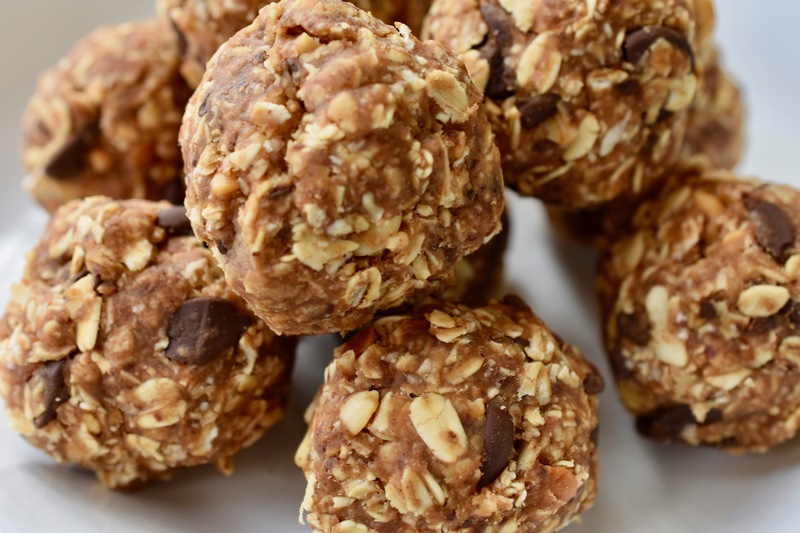 This recipe makes 20 individual bites. Be careful they are slightly addictive. I made these muffins for a client that has a number of food restrictions. They turned out perfect. What else I liked is that they were all made in a food processor for easy clean up. The hint of orange smells divine. 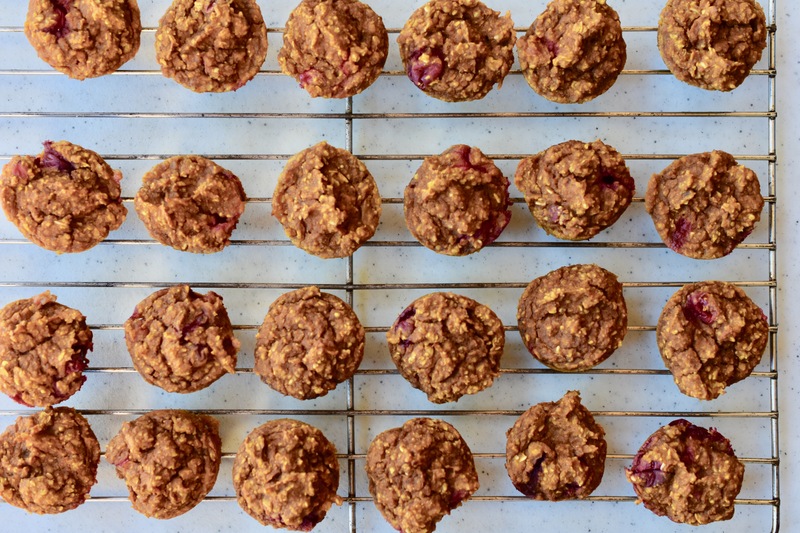 These muffins would be great for a brunch, snack, and breakfast. They really are good for anytime. Preheat oven to 350 degrees Process the banana, orange and orange zest until smooth and creamy. Add all the following ingredients to the food processor: pumpkin puree, Date Paste, flax seeds, Baking Spice Blend, pure vanilla extract, pecans, baking soda, and baking powder. Blend until all the ingredients are well incorporated. Stir in the cranberries into the batter. Spoon batter into prepared mini muffin pans. Bake for 17-20 minutes. Note: Want bigger muffins? 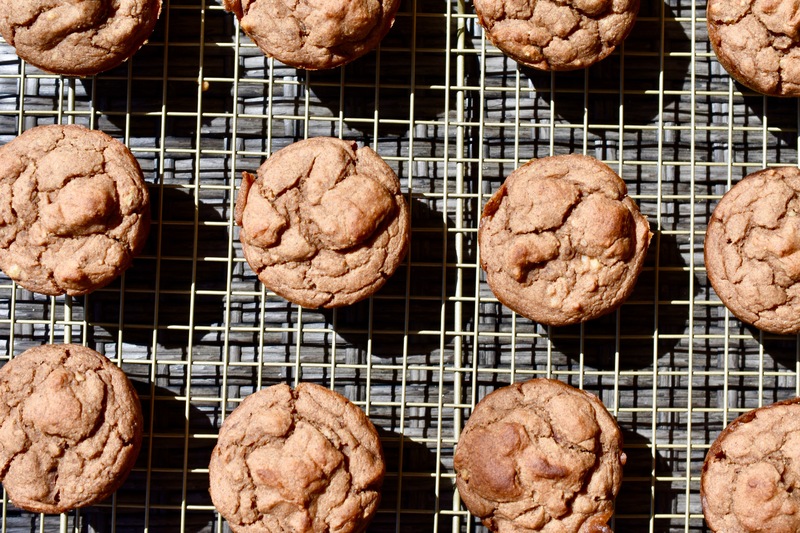 You can use regular size (12 well) muffin tines and bake them for 35-40 minutes. This recipe makes 24 mini muffins. I probably should have called this – If You Don’t First Succeed Turn It into a Parfait. Remember, I mentioned I had to make a second batch of the Oatmeal Chocolate Chip Almond Butter Cookies. They were too dry. They reminded me more of granola. Since they were granola like, I decided to make parfaits with them. The cookies fit perfectly into a small mason jar. Then I layered some ingredients. 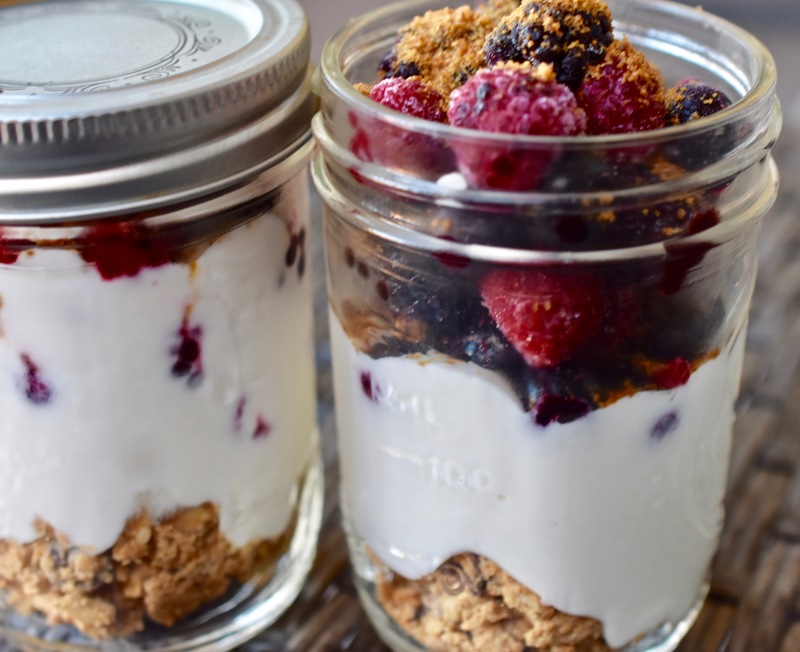 These parfaits make the perfect portable snack. You can change it up with different kinds of fruit. Layer in order of the ingredients. It took me two batches to get these cookies right. The first batch was too dry, yet the flavor was delicious. I have plans for the drier batch. I am thinking a breakfast cookie yogurt parfait with some berries. I added applesauce and that made all the difference. 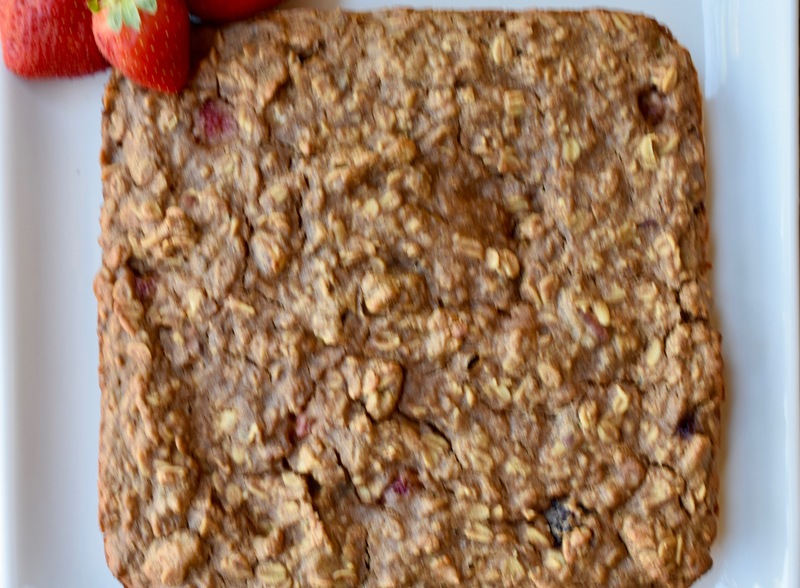 These are the perfect cookies to put in the lunch box. 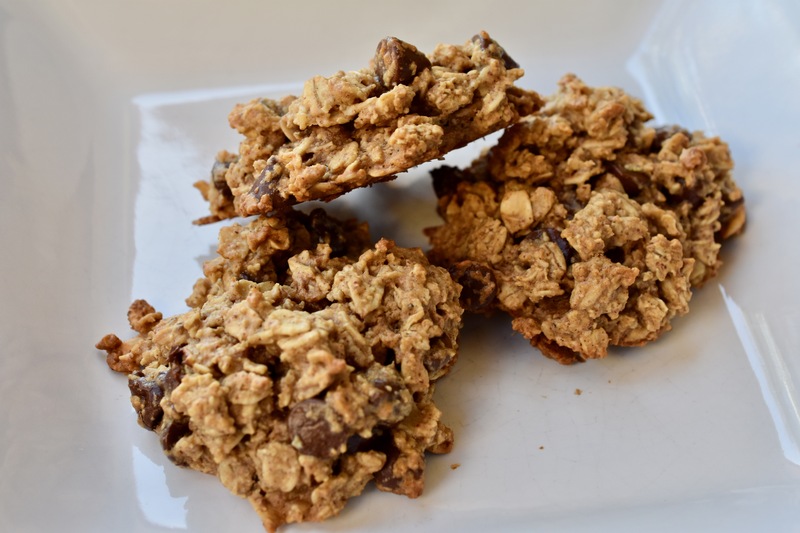 They are WFPB, Vegan and Gluten-Free. 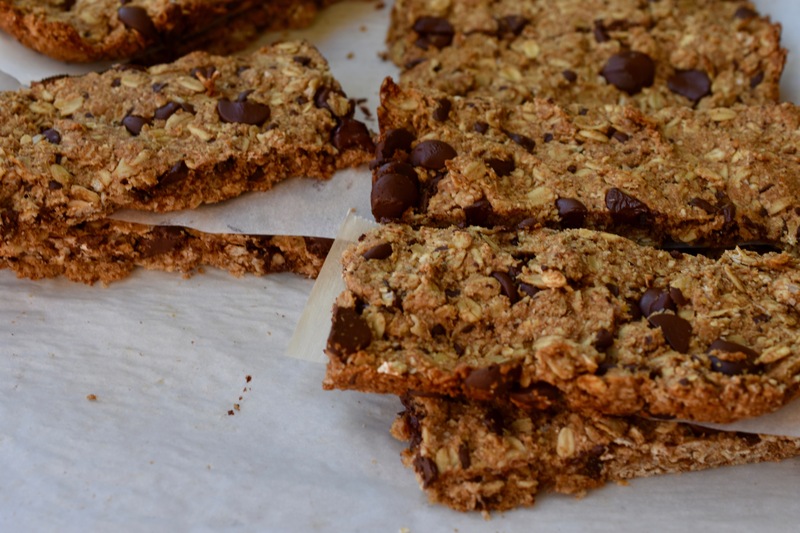 This recipe makes 24 cookies, just enough for yourself and to share with your loved ones. There is no guilt with these cookies, so enjoy. Preheat oven to 375 degrees. Line two baking sheets with parchment paper or silicone mats. Add the wet ingredients to the dry ingredients and stir until thoroughly combined. Drop the cookie batter by heaping tablespoons onto the prepared baking sheets. Bake for 10-12 minutes, until cookies are golden. Note: You can make the oat flour by grinding rolled oats in a spice/coffee grinder. I love pumpkin season, streusel and muffins so I decided to combine the three to give you this incredibly light muffin. You can even feel the lightness of the muffin as you spoon it into the tins. Usually streusel has butter, but I use almond butter instead to keep in the WFPB realm. I used Date Paste instead of sugar and a couple of other substitutions to increase the nutritional value and keep it in our line of eating. 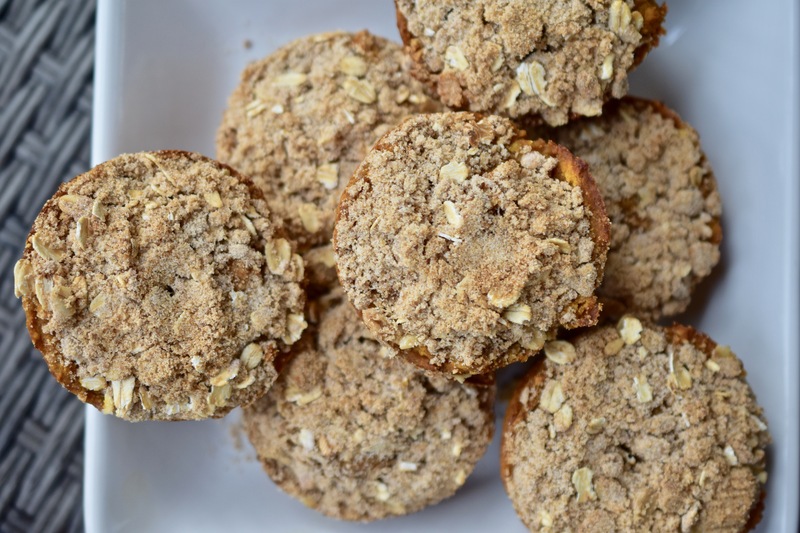 These muffins would be great for Christmas morning or as part of a brunch for New Year’s Day. It is so nice to feel like you are indulging, but it is really just the normal healthy way you eat. Mix together the streusel ingredients in a small bowl and set aside. Add all the dry ingredients into a food processor and process until the oats have turned into a flour and all the ingredients are well blended. Add all the wet ingredients to a stand mixer and mix until they are well incorporated. Add the dry ingredients to the wet and mix slowly. That way you will not be covered with the flour mixture. Gradually increase speed until all the ingredients are completely combined. Note: Until I figure out a way to keep the muffins from sticking to the tin I still spray the tin with a cooking spray. Let me know if you have an idea for this little problem. Evenly distribute batter into the prepared muffin wells. Spoon about a tablespoon of streusel on top of each of the muffins. Let cool about 10 minutes in the tin and then remove from muffin wells. You do not want the muffins to get soggy from sitting in the tin. Note: The first batch of these were not quite sweet enough, yet it did not stop us from eating them. They are that good. So adjustment of just a little maple syrup will add a little more sweetness. If you prefer something less sweet you can skip the maple syrup and it will be still so delicious.